Hey everyone, today I’m going to be taking a look at some of the best affordable perpetual calendar watches currently available. The beauty of a perpetual calendar watches is that it doesn’t require adjusting for the varying amount of days in each month. Perpetual watches are automatically synchronized to adjust the shorter longer months, including leap years so it doesn’t need to be reset. It’s an impressive feature that I’ve always loved having in a watch. 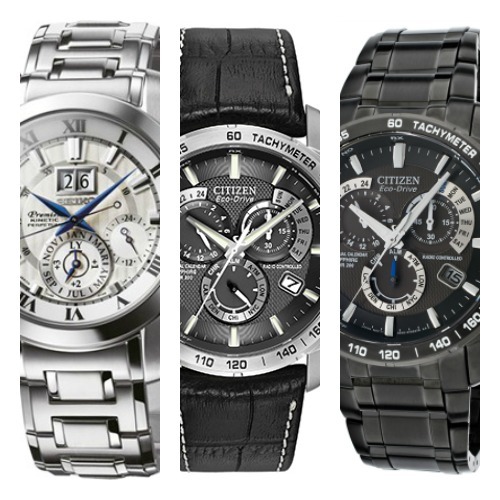 As I’m sure you can expect, Citizen lead the way in high quality affordable perpetual calendar watches, but whilst they do dominate today’s list, there are a couple of interesting wild cards included. 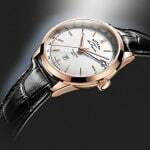 I hope you enjoy taking a look at these popular perpetual calendar watches below, as always comment below and let me know what your favourite was. 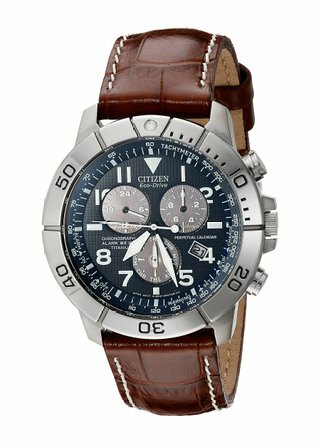 The first watch I’m featuring is this Citizen perpetual calendar watch with Eco-Drive movement. It’s an extremely sophisticated watch and very fairly priced considering. 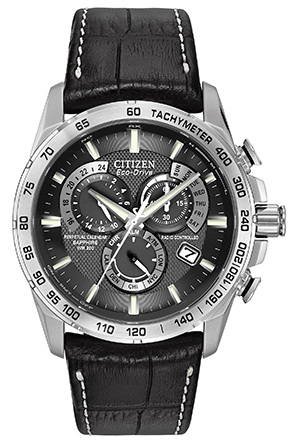 The Citizen Chrono Perpetual A-T model is a chunky black Ion-plated beast packed full of useful features. A key feature to this watch is the Eco-Drive technology, this is found in many Citizen watches these days as it proved so popular. 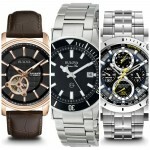 Eco-Drive watches charge themselves via the power of light, any light be it natural or artificial. Extra functions for this timepiece include chronograph timekeeping, tachymeter, radio controlled, 200m water resistance rating, and a useful alarm function. The radio timekeeping means this watch automatically syncs up to an atomic clock for ultimate accuracy. With an e651 calibre movement and a sapphire crystal glass, this has everything you’d expect from a luxury timepiece, without costing you a fortune. A very nice watch indeed. 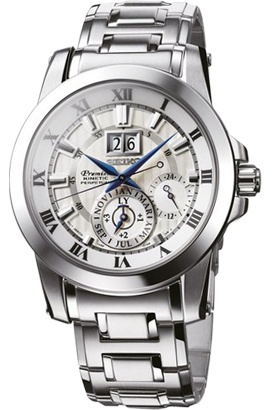 This is another one of the best selling perpetual calendar watches currently available. Whilst obviously, possibly not to everyones taste this still proves to be a highly effective, popular watch. Personally, it’s a little flashier than I would normally go, but I can understand some people love these style of bold watches. 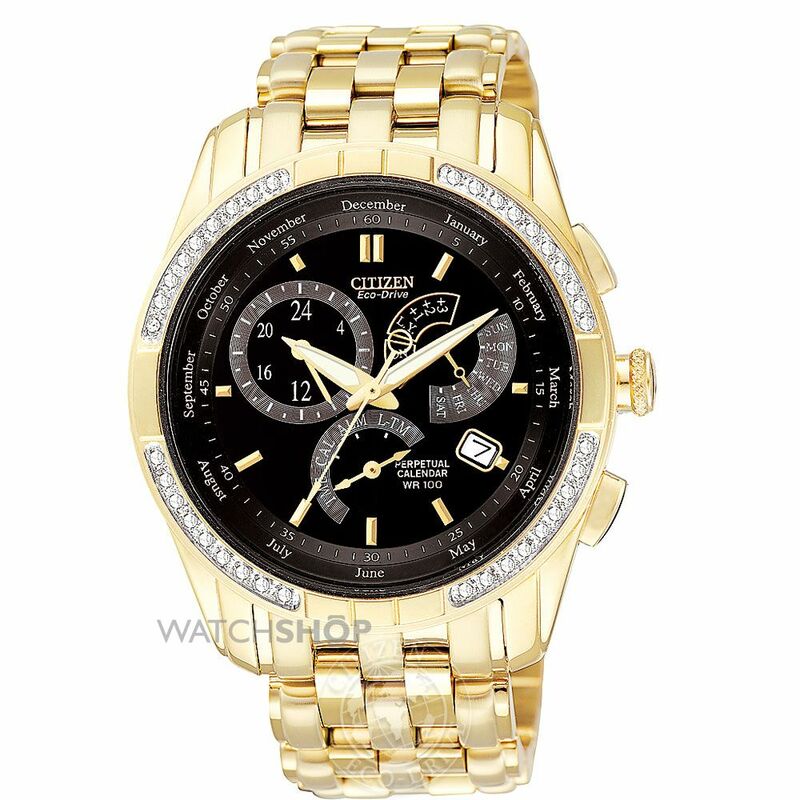 This Citizen calibre 8700 watch is PVD gold plated and features 36 stunning diamonds inlaid around the bezel. The gold detailing on the black dial stands out brilliantly, you can see the dual time display, plus the day & date perpetual calendar function easily. The watch also has a handy alarm system, as well as a suitable 100m water resistance rating. 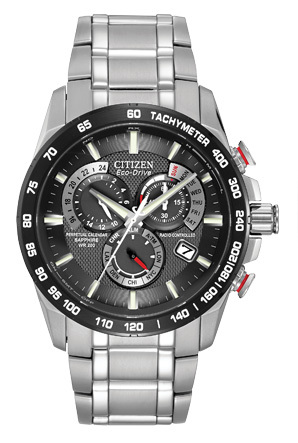 As with the previous watch, this model features Citizen’s Eco-Drive technology, powering itself by light, a very popular choice at the moment. For a long time this has been one of my favourite perpetual calendar watches. I love the design of it, and it’s absolutely packed full of awesome features. Thanks to its radio controlled atomic timekeeping, this is one of the most accurate watches in the world. It synchronizes with an atomic clock each day to make sure it’s as accurate as possible. 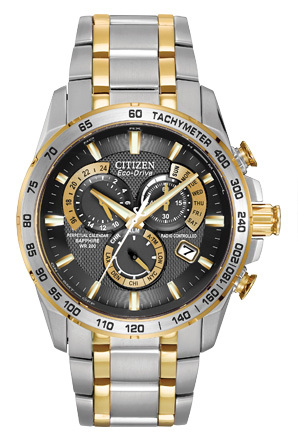 Another brilliant feature of this Citizen timepiece is the Eco-Drive technology. As with the previous watches, it powers itself via light and can hold it’s charge even in the dark for a very long time. Extra functions on this watch include a protective sapphire crystal glass, tachymeter, perpetual calendar, and an impressive 200m water resistance rating. Something a little different this time round from Seiko. This perpetual calendar watch functions with a Kinetic movement. I find kinetic movements quite interesting, they charge up similar to an automatic movement, but they can hold their charge due to their use of a quartz timekeeping mechanism, you’ll sometimes hear them referred to as an automatic-quartz. The display of this Seiko is very nice, I like the interesting placement of the date display at the top of the dial, and the blue detailing for the watch hands is a lovely touch, adding an interesting touch of colour to the dial. The Premier Seiko Kinetic watch also features a sapphire crystal glass for ultimate scratch protection and a 100m water resistance rating which should be more than enough for most people. This is another ultra high specification perpetual calendar watch from Citizen, I think just by looking at the dial you can see that this watch means business, and that’s why it’s a best seller. This Citizen watch is the highlight of the Red Arrows Collection, it’s part of the popular Skyhawk series, fully loaded with features suitable for pilots. The titanium casing and strap make this watch stronger yet lighter than stainless steel, it’s durable and hypoallergenic as an extra bonus. The case has a water resistance rating of up to 200m of pressure, it also features a rotating slide rule bezel for calculations on the fly. The contrasting red bezel looks stunning in my opinion, an awesome addition to the watch. The movement of the watch is another key feature, Eco-Drive technology means the watch never requires a battery as it charges from all available light, natural or artificial. It can even enter a power save mode when kept in the dark for extended periods of time, this way it conserves energy. There’s a handy power reserve display on the dial of the watch to help you with this. With the radio controlled atomic timekeeping the watch is synced daily with world time signals around the world, this helps function the perpetual calendar of the watch as well as having extremely accurate timekeeping. Extra features of the watch include an alarm, chronograph, count timer, sapphire glass, and a 200m water resistance rating. For ultra affordability when it comes to perpetual calendar watches, you can’t go far wrong with this popular G-shock watch by Casio. This is one of the most popular watches available and is known for it’s rugged, durable build with its stylish black display. The high impact oversized timepiece is one of the cheapest perpetual calendar watches on our list today. The casing is protected by this thick protective resin that gives it this incredible durable design, they’re designed to withstand an extreme day. Extra features of this G-Shock watch include a Japanese quartz movement, perpetual calendar and date function, LED backlight, digital tachymeter, and a 20m water resistance rating. If you love huge oversized watches, this model with a 55mm casing diameter is sure worth checking out. Like the look of the previous G-Shock watch but want to somehow one-up it? 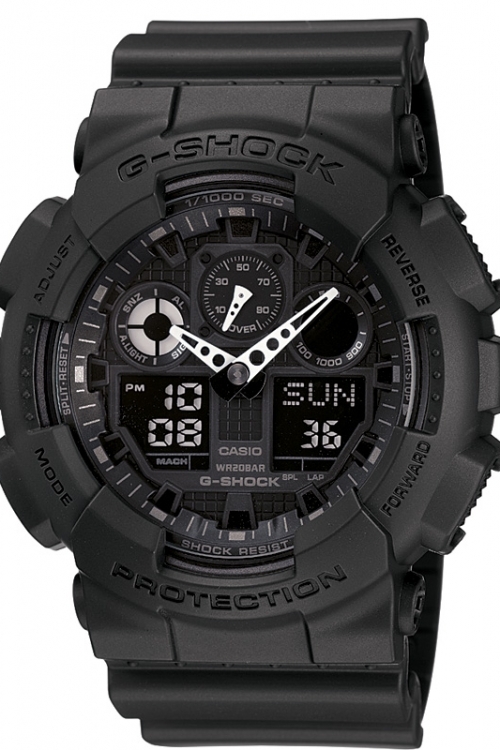 Then this G-Shock Mudman is the watch for you. 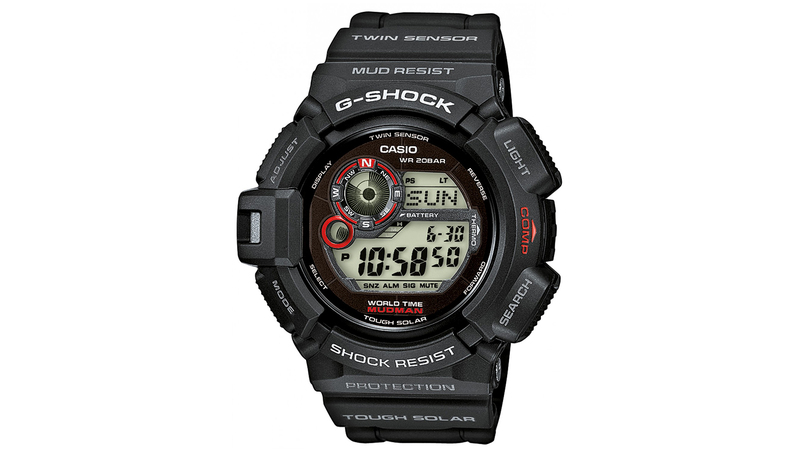 It has all the standard trademarks of G-Shock toughness, but in addition, features a twin sensor, this gives it the extra functionality of a thermometer and electronic compass. The resin case is also designed for added mud resistance, so for anyone who likes their Tough Mudder competitions, this watch is ideal. 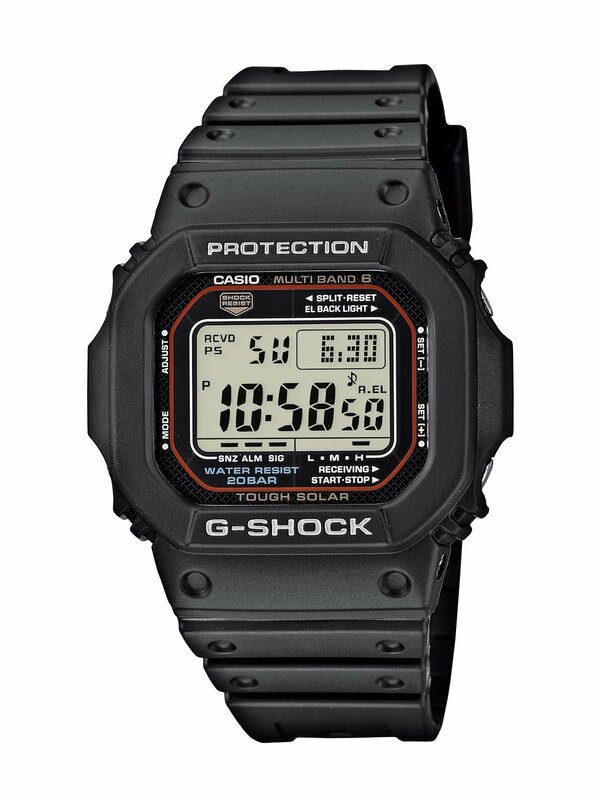 Along with the added twin sensor, the watch also includes G-Shocks tough solar technology, this allows the watch to charge up by natural or artificial light, never requiring a battery. Along with all these extra features, it comes with the standard perpetual calendar, stopwatch, countdown timer, world time display, and a dual illuminator backlight. As for water resistance, it’s rated for 200m, I wouldn’t expect anything less from a serious G-Shock timepiece. The last of our impressive G-Shock watches for this article is this rather impressive, yet suitably more subtle perpetual calendar watch. It’s a fantastic value G-Shock with the classic iconic case design. If you love your retro style watches but need your modern features, this is an ideal blend between the two. The watch features G-Shock’s tough solar technology, never requiring a battery as it charges and runs by the power of artificial or natural light. It’s also radio controlled making it extremely accurate and including a perpetual calendar feature. Extra features of the watch include a chronograph, countdown timer, world time display, auto-light, and an alarm. As I’m sure you’ve come to expect, it also has an impressive 200m water resistance rating. Back to the popular Citizen watches now with this ultra stylish perpetual calendar watch. The watch is radio controlled, making it extremely accurate as it syncs up with an atomic clock. It also runs on Citizen’s impressive Eco-Drive technology, so it never requires a battery, and charges it via the light around you be it natural or artificial. Extra features of this impressive chunky timepiece include a perpetual calendar, e651 calibre movement, tachymeter, sapphire crystal glass for unbeatable scratch resistance, and a 200m water resistance rating. Overall a stunning, smart watch. 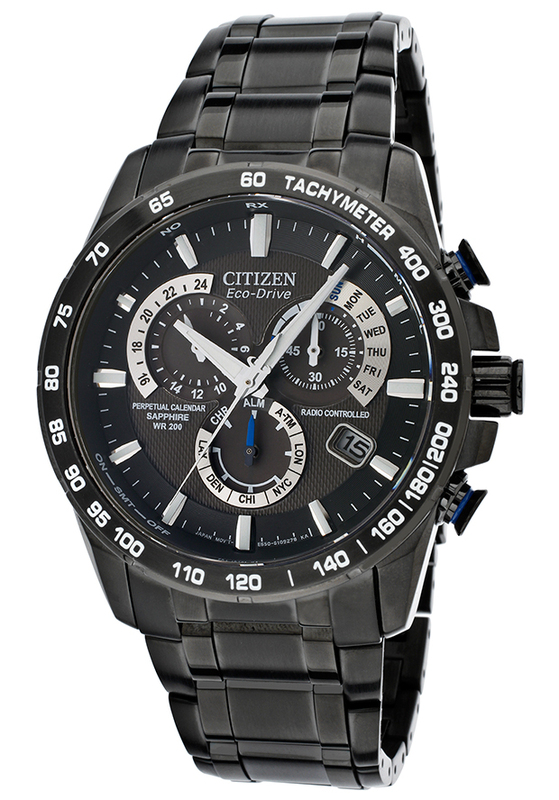 Another best selling titanium Citizen watch is the popular BL5250-02L. Titanium watches are all the rage due to their lightweight build, but extra added strength in comparison to stainless steel. It’s an ideal watch material. With its perpetual calendar you never need to worry about adjusting the date, a handy feature and I expect, exactly what you’re after if you’re on this post. With its Eco-Drive technology the watch never requires a battery as it charges itself up with the power of light, natural or artificial. 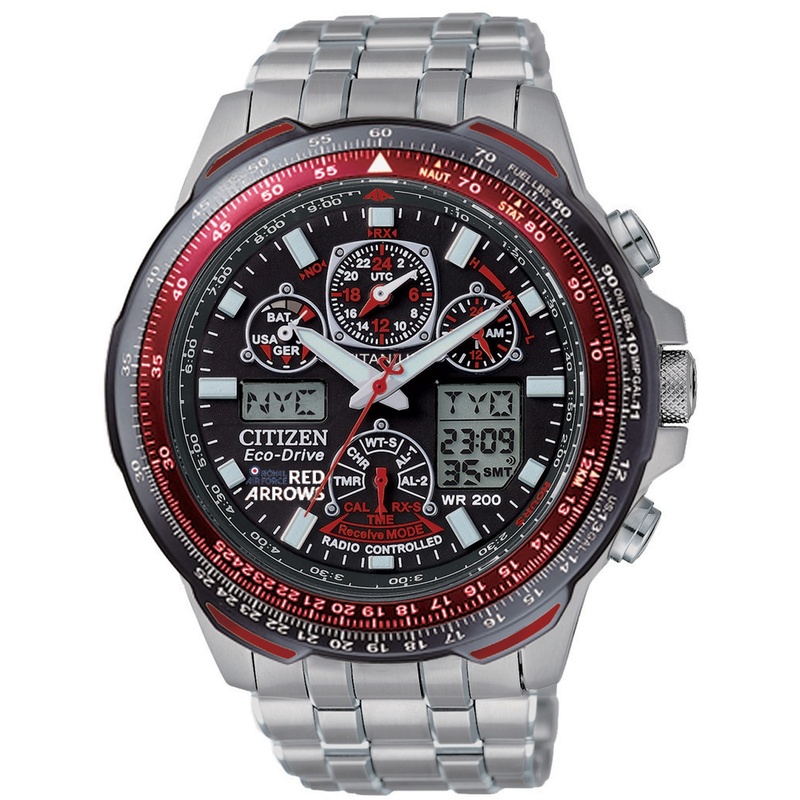 This has been a very popular feature for Citizen watches and can now be found in most their range. Extra features of the watch include a chronograph with tachymeter, alarm system, countdown timer, uni-directional rotating bezel, and a handy 200m water resistance rating. The last watch in our list is this rather impressive chunky looking Citizen Eco-Drive watch. As I’m sure you’ve come to expect from these watches, it’s full of impressive features, and looks the part. I love this two tone design they’ve gone for, and the detailing on the dial up close gives the watch that added bit of flair. The watch uses atomic timekeeping to make it one of the most accurate watches in the world, this feature means the watch uses a radio controlled function to automatically sync up with world atomic clocks around the globe. It’s also fuelled by light with Citizen’s Eco-Drive technology so it never requires a battery. Along with those impressive key features, you have all the other added benefits like an alarm, perpetual calendar, power reserve indicator, anti-reflective coated sapphire glass, and a 200m water resistance rating. A brilliant watch to end it on in my opinion. 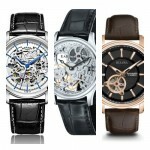 I hope you enjoyed taking a look through this list of the most popular affordable perpetual watches. I’m hoping to do a variation with the best automatic perpetual calendar watches in the future, so let me know what you’d like to see in the comments section below. I have both the last Citizen on your list and a Seiko Premier Kinetic, very similar to the one in your list, but has the gold touches and gold hands. It is not quite as good as the Citizen for timekeeping, but only gains about 12 seconds a year.